This Salem, New Jersey Original Series $100 banknote is estimated at $80,000-$120,000. Chock full of newly discovered U.S. national banknotes, high-grade rarities, ultra-high denominations, and the most important military payment certificate (MPC) collection ever offered, Stack’s Bowers’ upcoming paper money auction is expected to be a highlight of the American Numismatic Association’s (ANA) World’s Fair of Money. The upcoming sale includes what’s considered the most important military payment certificate collection ever offered at auction. 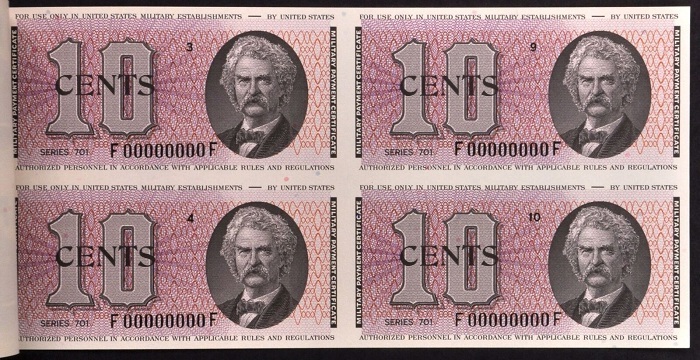 The national banknote section includes a number of significant highlights, including a Salem, N.J. Original Series $100 estimated at $80,000-$120,000. It’s the only First Charter $100 note known to exist on New Jersey. Another new discovery is a PMG 30 $5 Blue Seal from Fort Lauderdale, Fla., only the third note documented on the town. It is estimated at $20,000-$30,000. The upcoming auction also adds four serial number one notes to the New York census: they are a Brown Back from Herkimer; Red Seals from Lake George and Dolgeville; and a Blue Seal from Belfast. The highlight of the group is the Lake George note, which has an estimate of $40,000-$80,000. Other significant national banknote discoveries include a Black Charter note from Central City, Colorado Territory and a semi-unique territorial ace from Pueblo, Colo.; each note is estimated at $20,000-$30,000. Another previously unique charter — Sonoma, Calif. — now has a new documented survivor. Some classic rarities are also represented, including a 1933 $10 Silver Certificate graded as a PMG 67. That note is estimated at $75,000-$125,000. Leading the large size type section of the auction is a PCGS XF-45 1890 $100 Watermelon estimated at $200,000-$300,000. Other six-figure realizations will be possible from ultra-high denomination notes like a PCGS 35 1928 $5,000 and a PCGS 64 Binion’s $10,000. For more information, visit StacksBowers.com.